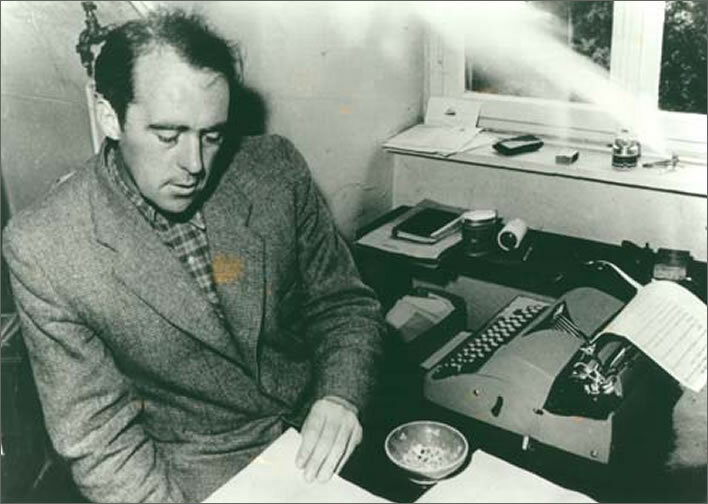 The twenty-first of December 2017 was the hundredth anniversary of the birth of the German writer Heinrich Böll (1917-1985). He was awarded the Nobel Prize for Literature in 1972. We mentioned him in connection with his war service and his marriage in April 2016. Things were not always golden for Böll: his early years as a writer were a financial struggle. Here is an anecdote to mark this anniversary. It describes the moment when Böll achieved his breakthrough to recognition and financial independence as a writer. It is 1951. He had been invited to the second meeting of literary group, Gruppe 47, in Bad Dürkheim. At these meetings some of the delegates read their pieces aloud to the assembly. Gruppe 47 had been formed to encourage and support young authors writing in German after the disaster of the war years. Its leading light was the German writer Hans Werner Richter (1908-1993). He has left us an entertaining account of the start of Böll's career at that meeting. Milo Dor (1923-2005), the other principal figure in the anecdote, was an Austro-Serbian writer. 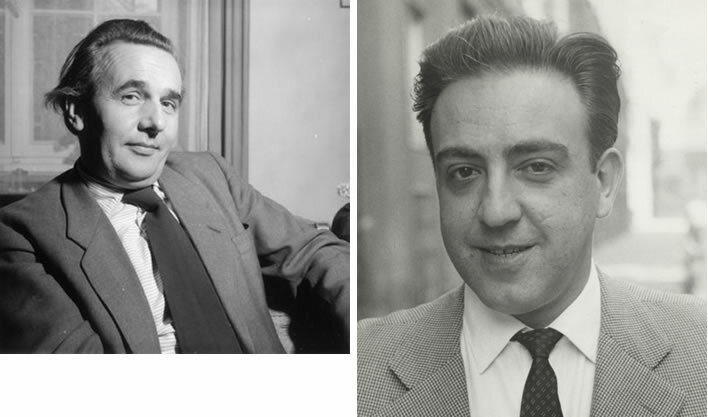 Left: Hans Werner Richter in January 1952. Image: Bayerische Staatsbibliothek München/Timpe. Heinrich Böll in his study in Schillerstrasse 99 in Cologne, 1952. Image: ©Hans Lenz. [Böll] read a short story, a story about his uncle, with the title Die schwarzen Schafe, [The Black Sheep]. Already after the first ten sentences a quiet chuckling set in, then from time to time loud laughter. It was a laughter of release – too much dark and problematic stuff had been read so far. I think the story was in some parts weak, in other parts good, but what impressed me was the sarcastic, satirical humour. Shortly afterwards the moment came for us to elect the second recipient of the Gruppe 47 prize. I walked along the rows of the audience, some seated and others perched, distributing white voting slips to all the participants, each of whom could write on the slip the name of the person they thought had produced the best work. Then I collected the voting slips in a hat. After the count Milo Dor and Heinrich Böll had obtained the largest number of votes, but not enough for an absolute majority. It came to a run-off vote, which Heinrich Böll won by one vote over Milo Dor. I had the thousand Deutschmarks prize money ready in my wallet and I paid it out straight away. And then I learned that before the run-off both candidates had agreed between them that whoever lost could borrow some cash from the winner. Neither had any money, both were poverty stricken. Böll, as he said himself, was as poor as a beggar. 'My children sleep in the coal box and are hungry. I have to get to the post straight away and pay the cash in.' And he ran with his money to the Post Office in Dürkheim with Milo Dor, who had borrowed a hundred Deutschmarks from him, right behind him. Richter, Hans Werner. Im Etablissement der Schmetterling: einundzwanzig Portraits aus der Gruppe 47, Deutscher Taschenbuch, 1986, p. 98f. 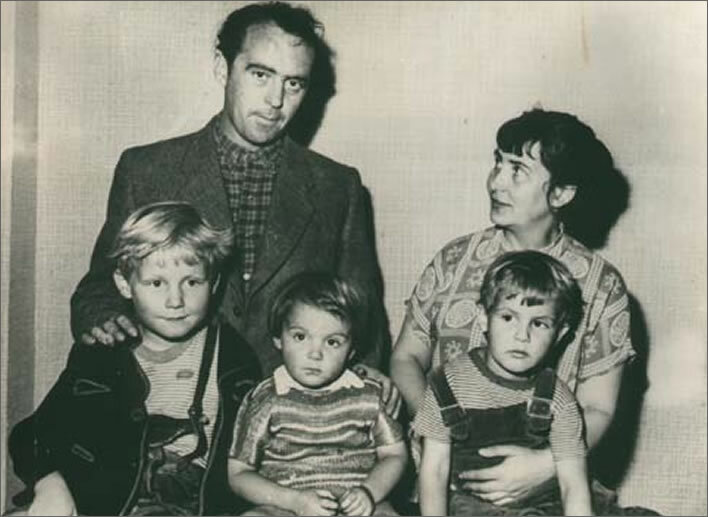 Heinrich Böll, his wife Annemarie and their children Raimund (1947), René (1948) and Vincent (1950) in 1952, the year after the award of the Gruppe 47 prize. Annemarie's work as a middle-school teacher kept the family going financially during this period. 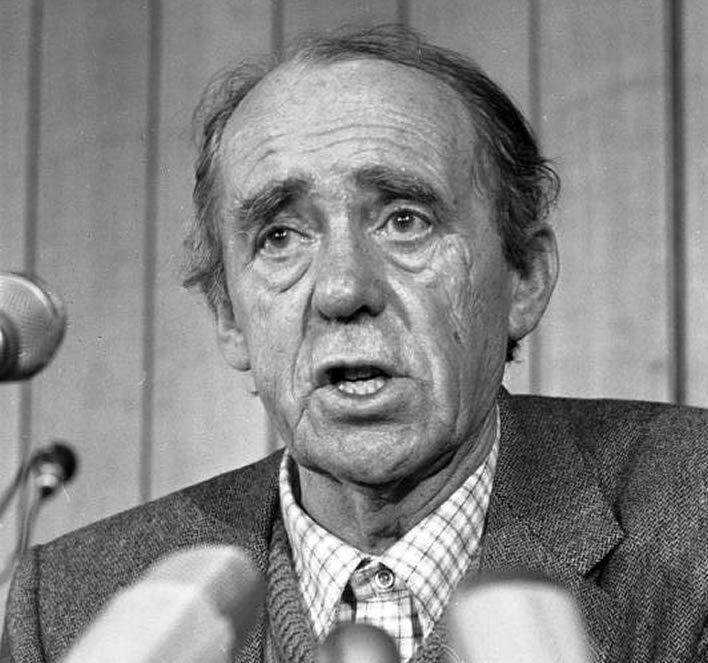 Böll the political activist in a press conference in Bonn on 22 December 1981. Image: Photographer Harald Hoffmann, Bundesarchiv.